Goop, mother, goop! All images by Francine Spiegel. Artist Francine Spiegel likes goop and gore. She needs about 10 pounds of grits, five jugs of pancake syrup, 20 cans of whipped cream, Fruit Loops, fake arms, and some blood, just to get started. Now that the goop has dried, Spiegel, who, on opening night became art herself performing her work in a storefront window, corresponded with us about some of her favorite indulgences. Howard Stern and Nellie Olsen from “Little House on the Prairie” made the cut. Sometimes it’s a pie in the face. But mostly it’s goop and gore and how women are affected by it. I started using my source material without cutting it up and pie-ing it. It’s a graphic approach but it’s freeing to work directly from any image that I’m drawn to. Images from different worlds can loosely exist and play off one another. The women are changing too. They aren’t as exposed and reconstructed, they’re buttoned-up and plain. It’s an effort to peel away the gore to explore the psychology underneath. Where do these concepts stem from? My interest in goop was gradual. I was making messy collages that were like landscapes and women were mixed into the terrain. Over time the mess affected the body and I focused on that. I became absorbed in the world of staged goop and women. There are so many layers in it for me. It’s defeating, empowering, about body issues and repression. It’s self-deprecating and horrifying. I love how goop is corrupting. It brings chaos and breaks the conventional border so that you can get to these things instantly. When Margaret Dumont gets a pie in the face or Carrie gets bloodied it makes me so emotional. I try to find a balance between making my work personal and not analyzing it too much. But I also really want to be critical and get to the bottom of things. I’m lucky to have a community of supportive artists. Most of us have been close since college. I paint in a pretty remote setting, which is good since I get distracted in the city. But it’s important for me to know my friends are psyched since I make it for them first. Performance has been a good way to get everyone together and work off the trust we have in each other. It’s hard to work alone after you’ve felt the energy of collaboration. What sorts of artists do you listen to? Frank Zappa, Kate Bush, Flo and Eddie, Roky Erickson, Harry Nilsson, Comus’ “To Keep from Crying”. But mostly I listen to Howard Stern and books on tape. And I have movies on when I work. Dawn of the Dead, Dead Alive, Alucarda, Black Sunday, White of the Eye, Death Bed, Let’s Scare Jessica to Death, Shivers, Nosferatu by Werner Herzog, Don’t Deliver Us from Evil. Growing up, what were your first impressions of women? As a kid I thought the women around me were loving, strong, independent and a little manipulative. My mom was strong. She was a widow. The way she dealt with her forced independence had a big impact on me. I learned I should have something of my own that I loved to do cause you never know. She took care of me but not herself. She was a drama teacher, she loved drama and I can’t help but love it too. How did she inspire your work? My mom’s battles have stayed with me for sure. I guess it inspires me to make art about women in horror. I can decide whether to save them or leave them for dead. What well-known females would you like to feature? 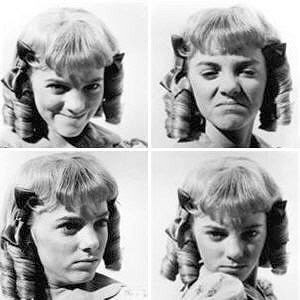 I’ve featured the mean girl Nellie from “Little House on the Prairie” but I think only a few people will recognize her. Nellie is a good villain. I’m still afraid of her. She’s not as recognizable as Melissa Gilbert, which is good because I just want to focus on her classic angry expressions. So I want to stay away from recognizable pop culture icons. I made a series with pieces of Beyonce and zombies but I’m not trying to make a statement about her… it gets confusing. It’s just the source material I was using. She initially inspired me because she looks like on monster on stage. People would ask me about her but I don’t have much to say so I stopped making them. Will men ever be incorporated in your works? Not really. But I’m not against it, there’s no room for it yet. I painted one man from “Lonesome Dove” actually. I feel like I have a lot more to learn about women in painting and also in performance too. It’s endless. Mud & Milk ends October 31. Deitch Projects, 76 Grand Street, 212-343-7300.